Our Velvet flocking pencil machine is based on the attraction of electricity to different substances. A strong magnetic filed is created by supplying high voltage current to the anode and having the cathode grounded. We are amongst the most reputed names in the industry, offering a wide range of Flock Cutting Machines. Input Voltage: 230 V A.C. The flock printing machine manufactured are fully automatic and can be availed in varied specifications. Less maintenance cost and high performance are significant features of this product. We assure the best for our customers and deliver the flock printing machines on time. Customization is done strictly as per the customer’s specifications. Hand Zoom Gun is suitable to flock garment pieces, uneven big objects and for sampling. We put forth a wide assortment of Flock Printing Machine, which is acclaimed by our clients for their high grade raw material. These machines are available in various patterns and sizes that are renowned for their dimensional accuracy. This product is highly commended by the clients for their anti-corrosive nature and strength. Reckoned amid one of the credible market names, we are willingly betrothed in offering to our patrons Container Flock Coating Machine. This is a flock printing machine , with high voltage . This is available in varies out puts starts in 35 kv to 100 kv. This attaches to chamber , and Mannual zoom guns also electrostatic trolly. 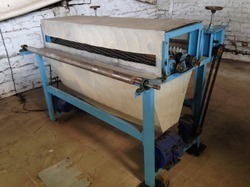 This high quality machine available in 25 kg (appx).